Republican House leader John Boehner, appearing on Fox News today, criticized the House health care legislation released Thursday as a bloated bill that his office claims will "raise the cost of health insurance for most American families, kill jobs with new tax increases and new mandates, and cut seniors' Medicare benefits." 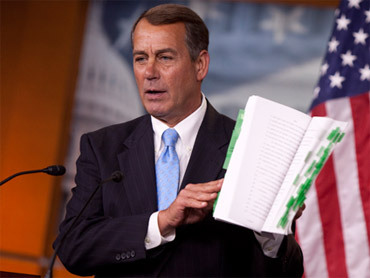 "All you need to know is there are 1,990 pages," Boehner said. "That should tell you everything." It should be noted that spending bills routinely exceed 1,000 pages, as do some other bills. President Bush's 2007 budget bill was 1,482 pages long. "It's not just the public option that will drive private health companies out of business," Boehner said on Fox, according to a transcript provided by his office. "It's the over 50 new agencies, commissions, mandates that will raise the cost of health insurance for all Americans, it's going to be immensely expensive at a time when we're broke, and thirdly, half a $1 trillion cuts to Medicare." Republicans have been beating the drum about the size of the bill, which runs about 400,000 words. A Boehner-penned op-ed in the Dallas Morning News Wednesday called for steps to be taken to make it easier for Americans to read the bill and warned of "Massive bills unveiled in the dark of night and rushed to a vote before anyone in America could possibly know the details." CNN's Jack Cafferty - not, it should be pointed out, a conservative - made a pointed comparison to past bills, noting that the "original draft of the 1935 Economic Security Act, which established the Social Security Administration, was 64 pages." Democrats countered that the bill hadn't changed much from earlier versions passed by committees and said nearly every aspect of it had been debated on the floor. But conservatives are having fun going after the size of the legislation; Fox News' Neil Cavuto brought a speed reader on his show to go through it for viewers. "It's longer than 'War and Peace,'" columnist S.E. Cupp said on Sean Hannity's show. "It's longer than 'Atlas Shrugged.' And it's longer than 'Les Mis.'" "Nineteen hundred pages," said Hannity. "That — if you can't put this down in 30 pages or less, it proves that this is a complicated, you know, bunch of bureaucratic garbage."